I’m excited today to share this tour of our kitchen on The Kitchn! As this post goes live, we will be on a way-too-long flight home from Spain… longing to be back home. We’ve had a great trip, but I am excited to get back to my kitchen. After two weeks of eating ourselves silly, a good healthy detox will be in order… And when that’s done, I’ve got a notebook full of travel-inspired recipe ideas to try out. All photos by Chris Perez, for Apartment Therapy. Thanks Chris for the great work! what a DREAM kitchen. 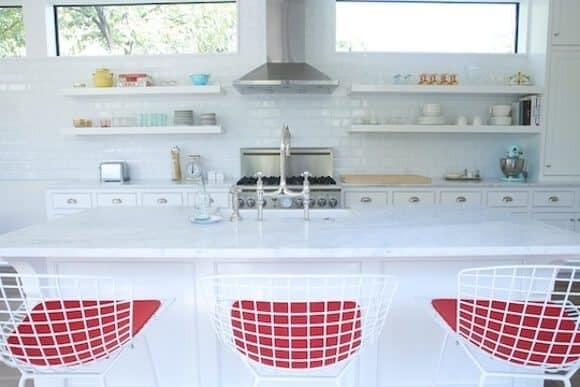 the white tile is beautiful and i love the pop of red. i’ve been enjoying all of your recipes so much. thanks for sharing! Oh my gosh, swoon swoon swoon. Your kitchen is soooo lovely and I’m so insanely jealous. Wow! Off to check out the rest of the photos. Hope your travels were great. I was so excited when I saw this earlier on the kitchn! You guys have become our newest foodie crush, since you enjoy a lot of the same asian flavors and fresh ingredients that we do. Every recipe I’ve made (and I’ve made quite a lot) over the last couple of months has been stellar. Can’t wait for more. Oh, and your kitchen is droolworthy. Hi Allyn, so nice to hear! 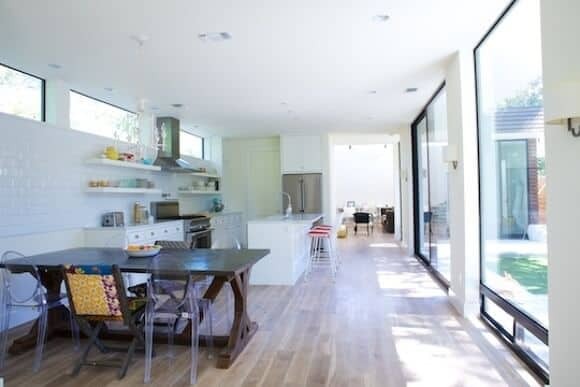 I’m so jealous of your beautiful white counters and huuuuuge windows! It’s as if your kitchen were specifically designed for food photography. lovely to meet you. love and lemons are two of the things I attribute adding so much zest to my life! who would know that there was actually a blog….and all the great recipes….wow. love your kitchen…i think we are twins. my kitchen is very similar in layout. my lower cabinets are dark and my uppers are white. white counters….twins I tell ya. stunning! your kitchen is so full of light – so ideal for eating and cooking in. Just found your site via Creative Index and I’m in love with your kitchen! Your open shelves and white tile are gorgeous – what a pleasure this must be to cook in! I always wanted a better look at your kitchen, I knew I’d absolutely love it! Safe travels home. I’m a new fan! Love your food, blog, and kitchen. I personally love our wood floors. In our last house, we put stone tiles (a type of limestone) in our kitchen and I regretted it because they were so hard and my back would really ache after standing on them for awhile. I never realized how much softer wood flooring is. Also, the tiles we had had white grout which was annoyingly not possible to keep clean. I can see more wear on the wood flooring in the kitchen vs other areas of the house, but the way they are colored really hides things well. I’m not particularly careful about the floor and they really hold up well. We were SO close to getting dark hardwood floors until some friends advised us against it… darker woods would be harder to maintain (especially with dogs). I can look up the brand info and send it to you… it’s an engineered wood… it’s real wood, but they were pre-finished. It’s a sort of pickled effect, rather than a stain color. anyway, hope that helps some! Hi Jeanine, we’re currently gutting our kitchen and will be putting in new flooring in the house. If you have a chance to look up the brand information for your engineered wood, I would be very grateful. Oh, wow! Your kitchen is insane. What a dream. I might never ever leave if I had that kitchen. Love, love your kitchen and blog! Just found it yesterday in “The Kitchn’s” email. Hope you will post how your trip to Spain was and if you had any suggestions as I am going in July! oh so exciting! Yes, I will post more. I have suggestions for sure. your kitchen is simply gorgeous! may I ask where you get the jars for all your dry storage? they look like just the size/style I’ve been hunting for! thank you! They’re the Le Parfait jars (http://www.leparfait.com/), I got them at the Container Store. They’re a bit pricey, but they have the strongest seal I could find in a jar. I also have some of these jars http://www.amazon.com/Bormioli-Rocco-Quattro-Stagioni-Canning/dp/B000V9ZRG2 but the seal is just a regular jar seal. I like my flours in a tighter seal because I had a moth problem once (grossest thing ever). I also store a lot of flours in my fridge for that same reason. With the marble backdrop of your food photos, I was always curious about what the rest of your kitchen looked like. It is so beautiful! Seriously, what a dream kitchen to cook in. Also can’t wait to see what inspired you in Spain. I LOVE your kitchen! That GIANT cutting board is incredible! Can I ask where you got it? Or is it custom made? Your kitchen is absolutely gorgeous! I need one just like it! What a beautiful article, and even more stunning kitchen! It’s always so fun and interesting to have a peek into someone else’s kitchen, and you two have a great one. We definitely share the same taste in kitchens, because mine (which we’ve been working on for a few years) has almost the same layout and a lot of white (which I love in a kitchen). Gorgeous … all of it! Congrats! Just found your beautiful blog and am so inspired. It’s such a fresh, pretty space – thank you! 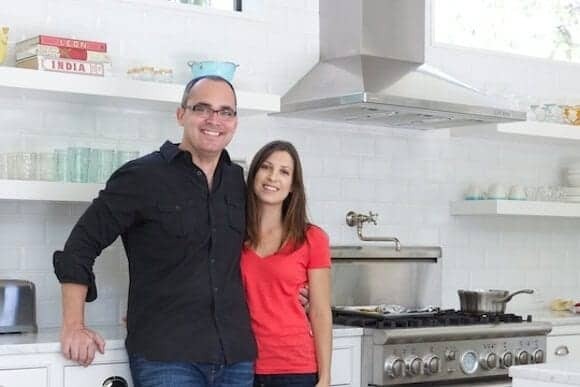 Your kitchen is amazing, and my second favorite thing, next to the turquoise/minty Kitchen Aid Stand Mixer, is that you wear a black rubber band on your wrist. Daily wardrobe staple, in my book. Ha – yes, I always have one (right now I have 2). so beautiful! I am jealous of your space. Thanks for sharing, dear! You have the most amazing home!!! WOW! Love it and congrats on the featured. Excited to hear your stories. You could top the cupcakes with icing in a spider’s web design and place a jellied sweet spider in the centre of the web. reason. You want a ghost who likes your subject and who can bring additional information to the project.